Offering free customer WiFi can do a whole lot for your company. You can attract new business, get more customer-generated content including reviews and social media shoutouts, and boost sales and customer satisfaction. While all of this is great, you need to also make sure that you’re not turning a customer service perk into a customer service problem. By getting smart about what can go wrong, you can maximize the benefits and minimize the drawbacks. Here are the five most common problems a business can encounter with free customer WiFi and what you can do about it. Your free WiFi is a reflection on your business and a part of the customer experience. It’s easy to think that because it’s not necessarily part of your product or service that your customers will excuse any imperfections. The thing to realize is that connectivity is a lot closer to air conditioning or power outlets. Customers expect it to work, and you’ll hear about it if it doesn’t. There are guidelines to help you figure out how much bandwidth you need. In “5 Problems to Avoid when Offering Free WiFi,” Robert Moskowitz suggests a rule of “120 kilobits per second for each user you plan to support at one time” as a general guideline. “Ten users will need 1.2 megabits per second. Twenty users will need double that.” If you need help, there’s a calculator. “Once you know how much you need,” he says, “compare prices among local internet service providers at that bandwidth level.” If you really need help you can block specific bandwidth-intensive sites, but you need to make sure that you’re thinking about how that will go over with customers. It’s a good idea to round up when you’re setting a goal for bandwidth, as those needs will only go up over time. Bandwidth is only half of the equation when it comes to offering a great connection to customers. If you have a public connection, ask your team how often a customer has approached them asking to “restart the router.” Generally speaking, this is a sign that you have something improperly configured that’s making it hard for users to connect. If your connection is spotty or slow, you need to figure out what’s going on. Christina Mercer’s “10 Reasons Your WiFi Speed Stinks and What You Can Do About It” is a great guide to help you troubleshoot your connection. The problem could be anything from an older router, old firmware, interference from nearby networks, or even the location of your router. No matter what, you want to make sure that your WiFi equipment isn’t leading to slow speeds or dropped connections. The problem with offering something for free is that someone is always going to try to take advantage of it. Just like L.L. Bean has had to change their lifetime return policy because of a few people abusing it, you’ll probably need to think about what to do about squatters who camp out all day taking up your space and not making a purchase. Require a minimum purchase to receive the WiFi access code, or put it on your receipts. Set up laptop-free “express” tables to maintain customer turnover. Restrict access during rush hours. Keep in mind that you still want to create a friendly and welcoming environment, so make sure that this is actually a problem before you do anything drastic. For both your customers and your employees, you need to know that you can send sensitive information like credit card payments over your network. That means that you need to know that it’s secure. No matter what business you’re in, you have information that would be valuable to hackers, whether it’s payroll data or customer logins. Having a secure network not only protects you from attacks but any liability concerns that result from being compromised. Make sure that your router’s security protocol is configured to the highest available setting. WEP (“Wired Equivalent Privacy”) protocol has known weaknesses and is generally considered leaky even though many businesses still use it. Instead, use WPA (“WiFi Protected Access”) or the even stronger WPA2. If your router doesn’t support WPA- or WPA2-level security, you need to think about updating your firmware or even swapping it out for something that can. You want your interactions between employees and customers to be positive. One place where it’s not good for them to mix, however, is in accessing your network. If they’re using the same access point, you’re opening yourself up to a lot of problems. Ideally, your network should have (at least) two separate access points: one for your employees that has a lot of security, and a second—also secure—access point for customers. 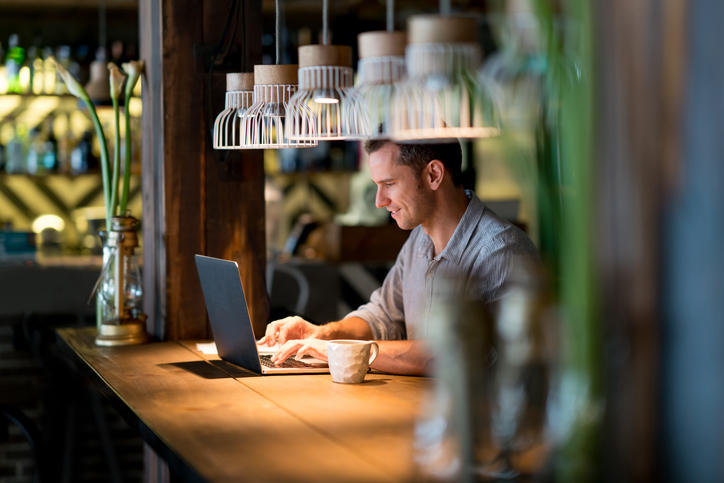 Using Service Set Identifier (SSID) technology to make separate access points lets you wall off your business network from your public WiFi, keeping everything safe and protecting you from attacks. You can also take advantage of SSID to automatically shut off your public WiFi when you’re not around to monitor it. If you have some extremely sensitive information on your network, you might want to consider making a WiFi hotspot that is entirely separate. No matter what, you need to make sure that you’re following best practices for making strong passwords and changing them regularly. Make sure that you have security measures and habits to help protect against everything from malware to viruses. Free WiFi is a great way to improve your customer experience, but you need to make sure that you don’t make these common mistakes. Make sure you have the equipment and bandwidth in place to offer customers a reliable connection. Be smart about dealing with network hogs. Secure your network for both customers and employees. Find out how Cox Business can help your business provide fast, reliable WiFi to customers. Visit www.coxbusiness.com.